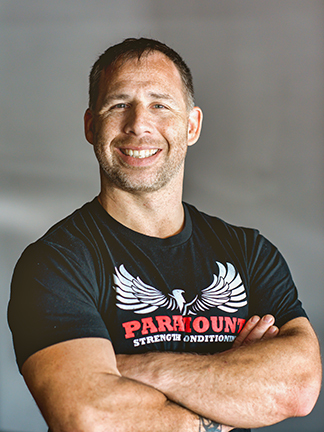 Paramount Strength & Conditioning, located in Mountlake Terrace, Washington, provides the highest quality personal training and elite coaching for individuals of all ages and abilities. These services are provided by certified coaches in private, semi-private and group format. Head-Coach Christopher Douglas is a CrossFit Level 2 Trainer with over 10 years of experience training others in the gym. He started professionally training individuals in 2006 while working at Explore Fitness in Seattle, Washington. In addition to his CrossFit Level 2 Certification (CF-L2), Christopher also possesses certificates in CrossFit Kids, CrossFit Football, USAW Sports Performance Coach, and the Apex Personal Training Certification. A former high school wrestler and football player, Chris became dedicated to educating himself on fitness and nutrition in an effort to maximize his performance in sports. Following high school, Chris took up bodybuilding and dabbled in power lifting, but soon became restless with the long, repetitive routines that came with training for those sports. After a few years of on and off training, he took a job in Seattle at a franchise gym, which helped revitalize his passion for fitness. He soon got into teaching classes with circuit-style training in addition to personal training. Moving to Ketchikan Alaska, he contracted with Ketchikan Indian Community, running a fitness program designed to help individuals who were diabetic or pre-diabetic. It was during that time he learned about CrossFit. In July 2010, Chris experienced his first WOD (workout of the day) after watching the CrossFit Games and fell in love with the program. As he began to research and learn more about what the program was, by early September he was all in. By October, 2010 Chris had his Level 1 Certification and opened the doors to his own CrossFit gym in January 2011. After successfully building a thriving CrossFit community in Ketchikan, Alaska, Coach Chris left the gym in good hands and returned to Seattle. 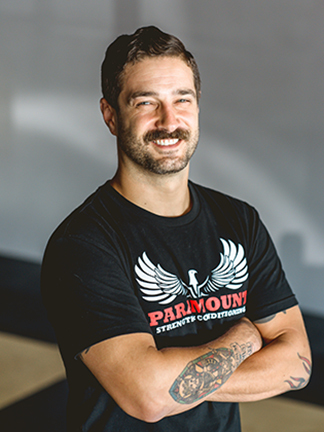 He launched Paramount Strength & Conditioning DBA CrossFit Paramount in Shoreline, Washington in November 2012. 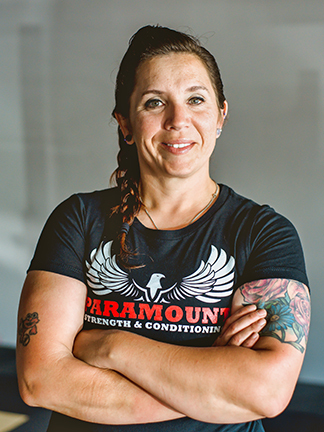 In January, 2016, Paramount relocated to its current location in Mountlake Terrace, where it enjoys a thriving community of fitness-minded members. As well, Coach Chris operates the Paramount Barbell Club, with membership open to anyone interested in Olympic-style weightlifting. Coach of State Champ, American Open Qualifiers, Senior & Junior National Qualifiers and Youth National Medalists. Aaron was raised in a musical family, and went to school to be a music teacher. This means that he didn’t discover the joys of fitness until later in life. After trying Crossfit for the first time in April of 2015, he was hooked! After getting his Crossfit L1 certificate in the summer of 2018, he uses his experience as a teacher to help people make progress in their fitness goals and make improvements in their life. Aaron is married with four daughters, and also is a teaching pastor at a local church. His hobbies include playing music, Mariners baseball, and enjoying Seattle’s amazing food and drinks. Coach Vanessa discovered CrossFit after being hassled by all her “CrossFit” friends in July 2010. Vanessa, being a previous Globo gym Areobics, Pilates and Yoga instructor, thought she was “fit enough”, regardless of her tummy pudge. It wasn’t until her first WOD she realized how out of shape she really was. CrossFit has been a long journey for Vanessa. It took her six months to reach her first kipping pull up, another year to hit Fran RX. Since then she has competed in local CrossFit competitions. Vanessa’s focus is constant incremental improvement. She loves coaching and sharing her passion with first-hand experience. When she’s not at the gym, she enjoys photography, hiking and three-wheeling with her husband and two dogs. Vanessa’s motto is “Have fun first, get stronger later”. Cecelia fell in love with yoga in 2006 and how great it made her feel. Since then, she has followed her passion to learn more. Compelled to share her love of yoga with others, Cecelia completed her Power teacher training in fall of 2015 and has been enjoying teaching yoga ever since; not only in the Powers style but Hatha, beginner, and restorative as well. Coach Kayla has a true passion for quality of life and being our best selves. She may not have a lengthy sports background, but she has over 15 years of experience in the competitive dance world of Los Angeles. Once she discovered CrossFit in 2009 and the amazing community of like-minded individuals made it an easy switch. Coach Kayla believes her dance experience gives her extensive knowledge in body awareness and body mechanics that she is able to use daily in the gym. 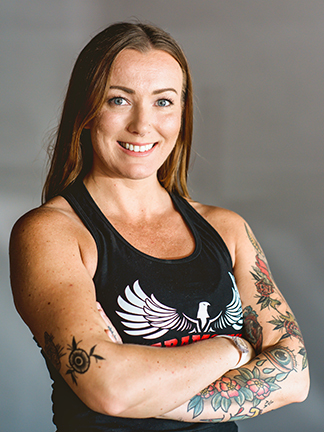 In her 10+ years in the CrossFit community, she has dabbled in local competitions, attended various athlete camps and movement seminars, as well as completing the CrossFit Level 1 and Level 2 Trainer courses. As a coach, she loves continuing her coaching education and adding as many tools to her toolbox as possible. She has obtained her Sports Nutrition Certification and has been working with athletes on their nutrition since 2015. 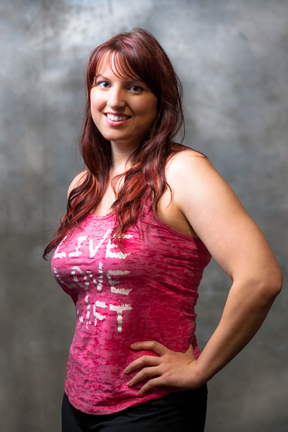 As an athlete, Coach Kayla gave the competitive sport of Bodybuilding a try. She competed in a WNBF (Washington Natural Bodybuilding Federation) show, taking first place and earning her Pro-Card in the Figure Division. Although she is retired from the sport, she is grateful for the knowledge gained from the training and nutrition experience. Through CrossFit, Coach Kayla also discovered the local weightlifting circuit and has dedicated her training to the sport. She has competed in both local- and national-level weightlifting meets, even earning the title of the 69kg Washington State Champion in 2018. She is honored to be your coach and excited to be a part of your fitness journey! 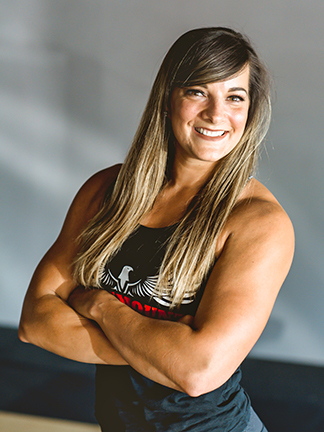 As the head coach and owner of Composite CrossFit for four years, Michelle experience includes hosting numerous competitions for team and individual athletes, programming workouts, personal training, and nutrition. Michelle has a background in the medical field as a cardiac technician running stress tests, swim instructing, and life guarding. Along with her husband and two little boys, the family is very active and love anything outdoors!